Am 16. April hält Felix Irresberger (Leeds University Business School) im Rahmen des TAF Research Seminars im Raum Q4.245 einen Vortrag zum Thema "Coin Concentration of Proof-of-Stake Blockchains". 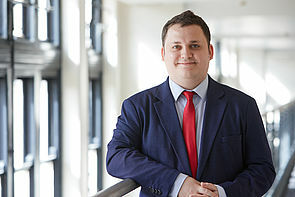 Felix Irresberger is an Associate Professor of Financial Technology at Leeds University Business School. Before moving to Leeds, he was an assistant professor at Cardiff University in Wales. Felix is originally from North Rhine-Westphalia and studied mathematics and statistics in Dortmund, Duisburg, and Essen. He obtained his PhD in Finance from TU Dortmund University where he specialized in systemic risk, capital regulation, and valuation of financial institutions. His recent research interests comprise the foundations and business applications of blockchain technology as well as quantitative risk management. He teaches courses on banking and financial technology at the undergraduate, postgraduate, and executive level both in the UK and abroad. He regularly attends & presents at conferences, conducts research visits and collaborates with researchers at universities and central banks across the globe, including China, United States, and wider Europe.